Last week as I was doing my regular workout routine … you know, 200 push-ups, bench pressing a VW Bug … something distinctly uncomfortable happened in my arm. OK, I was sitting on the sofa eating popcorn and watching Castle re-runs on TV, but it still totally counts as a sports injury. I had butter and salt on the popcorn, which (as everyone knows) makes the kernels heavier than your average styrofoam packing peanut. I’ve got a lot of miles on the chassis, and you don’t want to look under the hood. It ain’t pretty. It should come as no surprise that I tore either a tendon or rotator cuff. This means that I’ll need an MRI. Somehow, I have to schedule that in between work, a colonoscopy, and a root canal. At the moment, I have a gaggle of specialists on speed dial. This morning, I had to break down and start labeling my little brown bottles. These pills are for inflammation; these are for muscle spasms; these are for moderate pain; and these are for weeping and gnashing of teeth pain. Do not drive or operate heavy machinery. Damn! I guess I won’t be able to rent that backhoe this weekend. Since I excel at setting the bar low, my weekend plans are laundry, and putting away the Christmas tree. The bright shining star on my weekend is the Super Bowl. 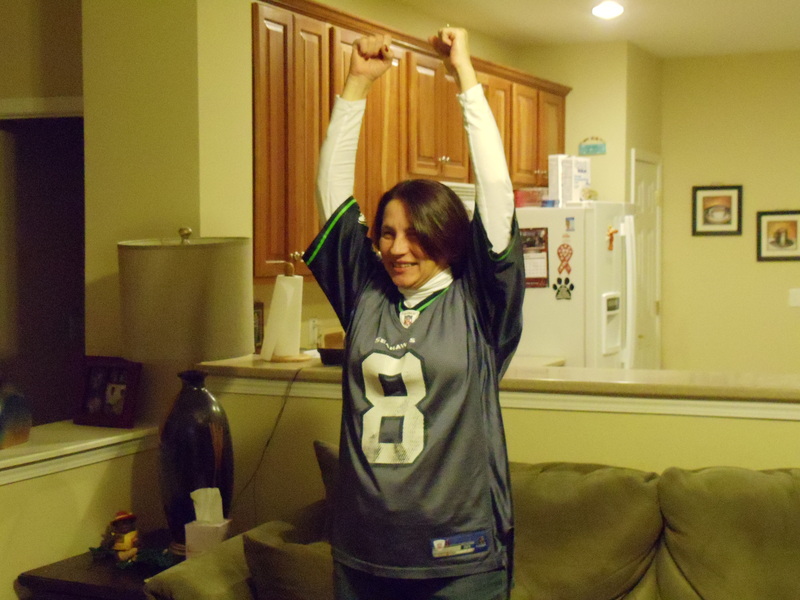 I will be cheering on my Seahawks (my apologies to my friend, Terri, who believes that the heavens opened up and God personally pooped out Peyton Manning. Maybe why God invented the colonoscopy.). This year, the official reviews on questionable plays have frequently gone in Seattle’s favor. When a referee looks under the hood, chances are that we’ll get the first down, touchdown, and an all-expenses paid trip to the Bahamas. We’ll take it. We have no shame. Fortunately, I’m getting back some use of my arm. 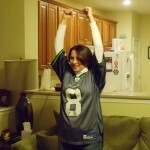 I just need to take it easy when raising my arms and doing my touchdown dance. If this blog sounds a little bit incoherent, it’s because I’m currently in a no-driving state of intoxication. Maybe the label should include a warning against operating a laptop. As you may have already guessed, the real reason for this blog is procrastination for packing Christmas lights (definition: wadding up the strings and stuffing them in a zip lock bag), and washing Dave’s socks. Wishing you a happy Ground Hog’s / Super Bowl / Laundry Day.